"Where is the Baby Derby?" 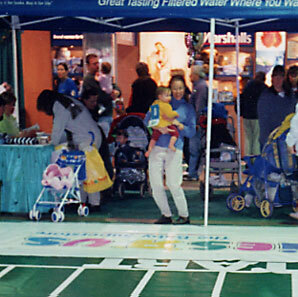 I urgently pant as I enter the Baby Faire at Boston's Bayside Exposition Center. The man taking my ticket doesn't know what I'm talking about. "The baby derby, my daughter is racing at 2:00 pm, I don't want to miss it." "They're racing babies?" he says skeptically. I race past and figure I'll just find it myself, but there is a bottleneck of strollers everywhere. Trying not to break stride, I dodge caravans of infants, toddlers and their parents. Eventually I realize I'm just adrift in a sea of babies, with tide and time working against me. I finally find an information booth, and am directed to the furthest corner of the exposition hall. As I slalom past toddlers and hurdle carriages, I spot my wife and daughter, greet them and am absolutely crushed to learn that I've arrived too late. I can't believe it. My firstborn's premiere sporting event and I've missed it. What kind of father am I going to be? My wife, Susan Mann, calmly assures me that we can enter Jillian in the next race at 3:00. Phew. We'll have plenty of time to relax, look around at all the baby paraphernalia that we're very happy to live without, especially given the price tags, thank you. Plus the fact that we're already swamped with hand-me-downs of every sort. 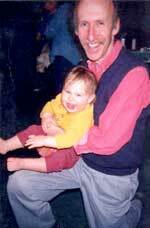 Susan and I have both come into parenting relatively late in life. In my mid-forties, I would qualify for membership in FOOOFF (Fraternal Order of Old Fart Fathers) and Susan's not much younger. If we're not mistaken for 10 month old Jillian's grandparents already, we probably will be by the time parent/teacher conferences roll around. But we've been around the block long enough to have entered into parenthood as eager as can be. And we've been around the vendors here long enough to seek a refuge before the Big Race. 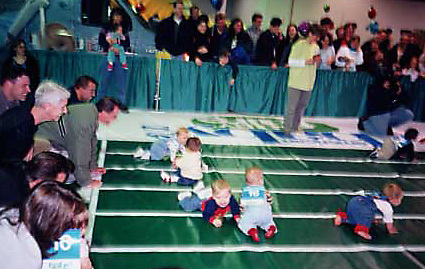 Ever since I'd heard about the Baby Faire's crawling baby race, I wanted to see it. And I also happen to have one adroit little cherub to cheer on. So I've been atwitter with anticipation for weeks. I'm even stealing away from my storytelling conference for the afternoon. I'm certain this will be fun, and sure, I'd like Jillian to do well in the race, but the emphasis of course is on the fun, right? Okay, I'd really like to see her win. We even had a training session at home. 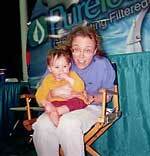 Jillian has already had quite a bit of fame in her young life. At the tender age of 20 hours, she had a 20-second cameo on the 6 o'clock news. The medical center where she was waterbirthed was being used for a special on breastfeeding and they happened to need a fresh baby for the segment. Five months later, she was on prime-time television in Japan, featuring a classic, multi-generational New England cranberry farming family, for which Mann Family Farms certainly qualified. As the youngest of the three generations in that documentary, our very own little cranberry again got to steal some scenes. 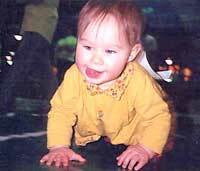 As cute and special as we know she is, however, she only achieved stardom by being in the right place at the right time. But now, just five months later, this was her chance to take matters into her own hands (and knees). But first a few preliminaries: in order to enter, we have to sign a liability waiver. Hmm. 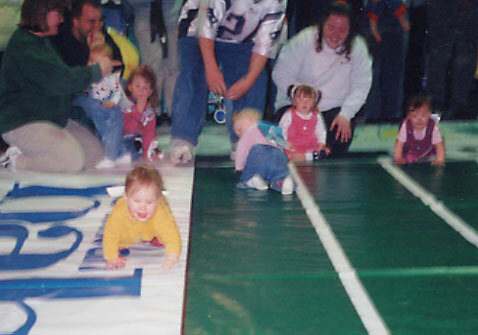 What could possibly go awry with a crawling race. A side-swiped baby bouncing off the wall at 1 mph, overturning and causing an eight-baby pileup? Doubtful. It's probably just for the overzealous fathers who get murderously competitive, like the hockey dads I've heard about in the news, actually killing each other over a game; can you imagine?! What incredibly immature role modeling. Not that I lack competitive spirit, myself. A former cross-country runner in high school, I won a race or two in my time. I even placed a respectable eighth in the Vermont state finals. So when my Jillian, who definitely has some quick genes going for her (compliments of her old man) gets her adhesive racing number pasted on her back, whoa baby! Number Eight! It's an omen. She's destined to follow in her old man's fleet-of-foot steps. God, I'd do anything to see her win. Well, short of blackjacking some baby's knees. Okay, we've got some time to get prepped and psyched for the race. Susan is about to nurse her, but hold on just a diaper-changing minute, here -- that would have the opposite effect of sport-enhancing doping. Hel-lo? As a frequent observer of the Twilight Zone that often follows a breastfeeding session, I know that hormone-induced mellowness is the last thing we need. No -- that would never do. Better to just have Susan subtly flap the bottom of her blouse at the finish line to give a hungry Jillian all the motivations she needs. Other parents have been seen to shake rattles, toys, and baby bottles. How synthetic. Keep her thirsting for the real prize, that's the ticket! Dressed for what their parents deem success, other babies are seen sporting every kind of footwear possible. Designer racing shoes for creatures that can't even walk yet? Yeah, right, like a baby's going to "Just Do It"! Do what, other than poop? 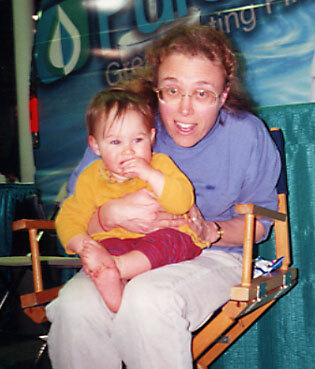 Speaking of poop, one of the workshops offered at the Baby Faire which we would have liked to attend was -- scout's honor -- "Reading your Baby's Diaper." Are parents invited to bring a fresh sample? Is it like reading tea leaves only more aromatic? I wonder what Jillian's would say: "You are destined to be a winner"? Or perhaps "You don't digest carrots well"? Incidentally, for the occasion, it's out with her normal cloth diaper and diaper wrap, in favor of (gasp) a lightweight, aerodynamic, disposable model for maximum mobility. As for the rest of her outfit, she's sporting snug, striped pants and a light flouncy blouse with nothing extra to get in her way, while other babies are seen burdened with heavy overalls or ruffled dresses. And now back to the feet. Since no part of the foot is really involved in crawling, except perhaps the toes, Jillian is the only one going au naturel, barefoot for better toe traction. If talc wasn't carcinogenic, for better hand grip on the vinyl, her increasingly excited coach might even add that to her arsenal of advantage not to mention a little grease on her knees for less drag. Don't worry Jillian, Daddy won't shave your head for the race, though it might give my lean, mean crawling machine a psychological advantage over some of those beribboned and curled bonbons. The first heat is about to begin. The first and second-place winners will join the winners of the next two heats in a Race-off for valuable gift certificates. Wow, prizes too! Come on Jillian, a chance to earn your keep. Maybe after this race, there'll be the state finals, the nationals, the baby Olympics, product endorsements and TV commercials! Boston Marathon, here she comes. It all starts here and now. We take our position in the last Lucky 8th lane. Me, and Jillian, poised on all fours at the start; Susan at the finish. I frankly wonder if Jillian sees her mother as a separate entity yet, or still a detachable extension of herself. In any case, all she has to do is close that gap and plug mom back in as quickly as possible. Rules are announced by the referee, looking very official in his black and white striped shirt. 2. Only babies are allowed on the track. 3. Babies do not have to stay in their own lanes and rarely do. 4. 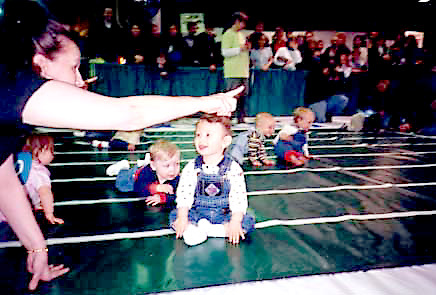 Any baby standing and walking in the race can be applauded for their precocious bipedalism but will still be disqualified. 5. Any form of cheering or enticement is highly encouraged. 6. 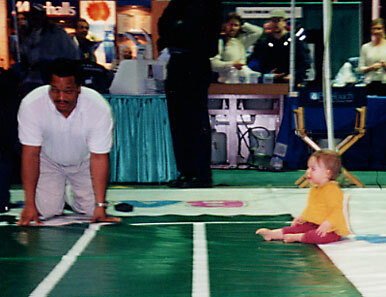 Lastly, babies must reach the finish line themselves and not be pulled across. Lane Eight! Jillian Estelle clearly understands the words of her dad's rallying cry to "Close the Gap!" Her eyes are locked on the prize and she blasts off like a little rug rocket towards her refueling station. Granted, her trajectory takes her a bit wide of her lane, but that is no matter as she barrels down the track with a singular, or should I say twin focus. 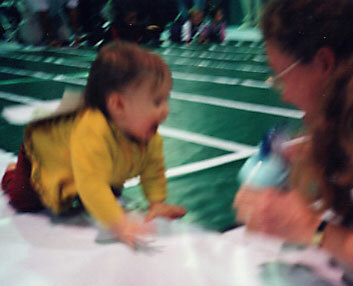 She prances across the finish line to her jubilant mother and accepts a temporary sippy cup rehydration before she is later and more discretely awarded her First, then Second, prizes, cradled in mom's arms. Susan, who jokingly chided me earlier about my own competitive hockey-dad hormones, is ecstatic and admits that her heart was pounding throughout the whole action-packed minute. And it is easily another whole minute before one of the other seven rug ramblers gets it together to dribble across the finish line. Our cup runneth over with pride. 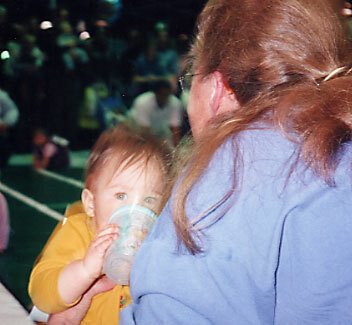 Our little Jillian Estelle was poetry in motion, as she bounded across the court like a little gazelle. We relive the excitement while we try to calm ourselves on the sidelines and watch the next heats, sizing up the competition. Every heat is a stitch to watch and the referee's color commentary adds immensely to the action or inaction as the case may be. "On your marks, get set, G0! Does any baby want to take the first move? These babies are all such good sports. After you. No, after you, I insist. Okay, #4 in the Pokemon outfit is off and crawling -- he's no slow pokey mon and he's not stopping. Well, we know who the first place winner will be. No, he has stopped one inch short of the finish line. Mom is trying everything to get him to hiccup over that line. He's never seen his mom so animated before and is delighted to just sit and watch. Back at the starting line, one little princess is off, but she's stopping now to readjust her headband. Yes, image is important; you look marvelous, dear. All right, now there's more movement afoot. A string of babies have caught sight of a bunny on the sideline and they're after it. It looks like a whole pack of plodding greyhounds are defecting off the track. 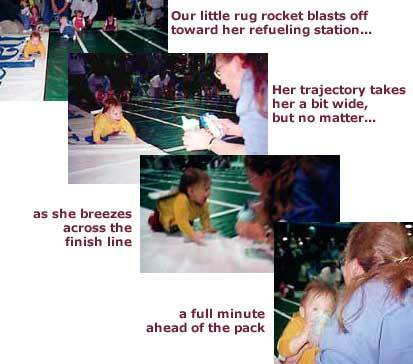 Wait, a mom at the finish line is frantically shaking a box of Cheerios. It's not working. 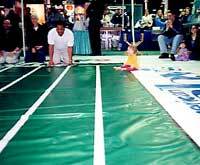 She's tossing one down the track. Her baby sees it. He's after it, he's got it, he's stopping it to eat it. Mmm good. Here comes another Cheerio. Other babies have caught scent of their favorite snack. There's a scramble for it. Oops, there's a pileup in the works. There are going to be a heck of a lot of speed bumps for her baby to run over. Don't worry folks, we've got the Jaws-of-Life standing by if we need it. More Cheerios are raining down the track. It's a madhouse. 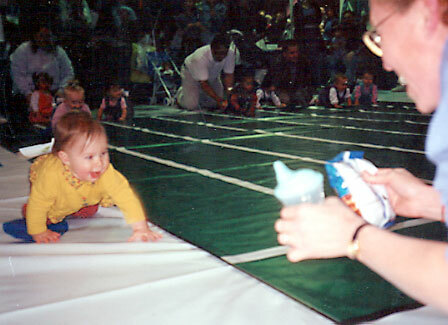 Never been anything like it in Diaper Derby history. Oh, now what? Princess Headband has a Cheerio fragment imbedded in her hand. She's showing it to everyone. Yes, we see it, dear. No, sorry, you can't demand a restart. Now she's back in gear, she's bearing down on Pokemon who hasn't budged yet. 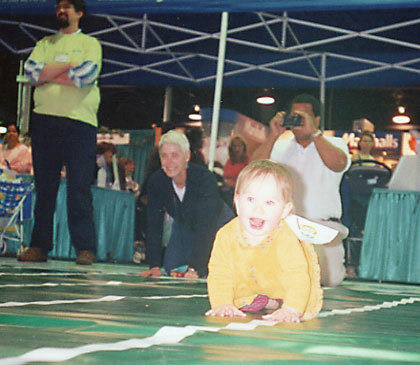 It's going to be a photo finish, and she wins by the cutest little nose." Needless to say, everyone is in total hysterics. After the dust settles and the Cheerios are swept away, tension mounts for the final Crawl-Off of the winners. Meanwhile, back in the observation deck, there is absolutely no tension however, on the part of Little Miss #8 who has long since "closed the gap" and has been obliviously nursing on the sidelines during all of this excitement. I, in turn, have been totally absorbed in the races and was unaware of this development. Had I noticed, I might have tried to cut her off, just rationing a little appetizer so she'd still have that hungry edge for the checkered flag, or the flapping blouse, as the case might be. But Susan, being the softhearted, feed-on-demand mom that she is, probably wouldn't have gone for it, and it's all moot now as she has already allowed Jillian to top herself off. Uh oh. Will it give her the recharge and courage to go out there and do what needs to be done, or will it pull the vinyl out from under her speedy little knees? We'll soon find out, as she and I take our position now on the favored post lane Number One. Lane Number One. Jillian takes a token paddle across the starting line and plunks down. Our former gazelle has turned into a lane hog. I try to imagine what is going on in her milk-clouded mind. Is she giving the competition a sporting head start a la tortoise and hare? 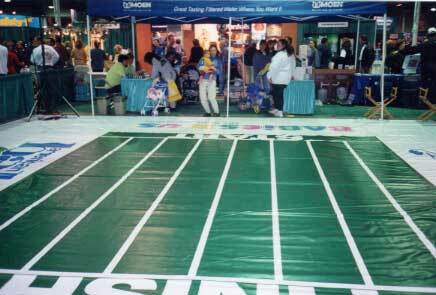 The track is only twenty feet long, dear. Perhaps she figures she has already established herself as the hands-on winner -- been there, done that -- what else is there to prove; a pragmatic decision to retire undefeated? Or, yikes, could this be early genetic evidence of her father's attention deficiencies? Or is she just one sated little infant happily under the influence of soporific breastmilk? 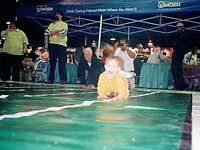 Whatever the reason, Jillian is sitting there contentedly watching all the excitement, looking at everything but her two parents trying to get the attention of the 8-Ball sitting just two paces from the starting line. I realized then that depending on which way you look at the number 8, it could also be seen as the symbol for infinity, and through my tears of laughter, I see this cosmic little buddha, totally at One with herself, possibly pondering that same conundrum. Who says the Dalai Lama can't be a girl? I've heard of athletes being in the Zone. Well, Jillian is in the ozone. maybe we could camp out here -- it doesn't matter, just finish what you start and you'll always be a winner. Just come to papa." As the commotion (and hormones?) subside, and there is nothing else left to look at, Jillian finally notices us and flies off toward us as before. She's like a bat out of nirvana, sprinting straight to the finish and into the arms of her cheering parents who are laughing so hard that they have to strain to not leave any wet spots on the vinyl. Neither could decide which they enjoyed more, the utter thrill of victory or the side-splitting pisser of defeat. As for Jillian, she couldn't have been happier with her booby prizes. Who says the Dalai Lama can't be a girl?